Safety/Quality Approvals: Our company has obtained ISO9001: 2008 Quality management System certificate, baby playpen was approved BS EN12227, AS/NZS2195: 1999 tested by SGS company, TPA 1974(for Australian and New Zealand Market), Baby playpen was being applied and tested on ASTM standard in B. V. H. K. office. BS EN716, BS11073, the Furniture and Furnishing(Fire)(Safety) Regulation 1998(Amend 1989 and1993), tested by SGS company, tested on France standard XPS 54-081 in France, Baby playpen was approved Canada Test by Customer in Canada. Baby rocker was being applied and tested on EN12790: 2009 tested by SGS company. 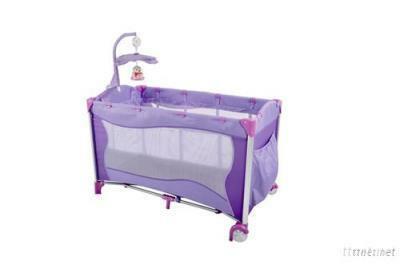 	Baby playpen with straight aluminum legs. Curved short rails. 	With toy bag, game entrance.